The Golden Slipper Stakes is a Group 1 race for two-year-olds held at Rosehill racecourse as part of the 2019 Sydney Autumn Racing Carnival and iTipsports provides Golden Slipper tips as part of its expert Sydney Racing tips service The race is run over a distance of 1200 metres under set weight conditions and is worth $3,500,000 in prize money. iTipsports Racing will be there with all the expert Sydney Racing Tips action. The Golden Slipper Stakes has the largest prize money of any two year old race in the world and has become the pride and joy of the Sydney Racing tips Autumn Carnival and our Golden Slipper tips will cover commentary on the full Slipper field, commentary and pricing every horse from our expert Sydney Racing tips analyst Blaazing Ben Perkins. The Golden Slipper Stakes was first run in 1957 with prizemoney of 20,000 pounds and is now the world’s richest race for two-year-old race. The race receives world wide exposure, especially in the racing rich countries of UniteD Arab Emirates, China, Hong Kong and Singapore who are all looking for breeding purposes the stars of the Golden Slipper. 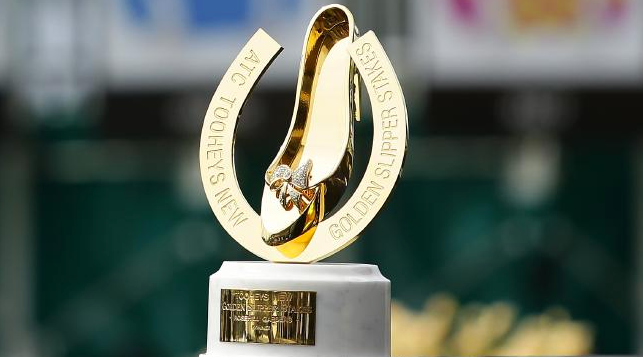 Golden Slipper Day is the biggest race day of the Rosehill racecourse racing over the Sydney Autumn Racing Carnival. The Golden Slipper Stakes is the richest race and is the premier event for youngsters in this country. The lucrative purse, the richest in the world for 2 year olds has in the space of a very short period of time has had a huge affect on the Racing breeding and buying industries in Australia with everything being geared toward a quick return on investment as opposed to the “old ways “ of breeding stayers who take 4-5 years to get a return on investment. This was thrown “out the window” and gearing breeding toward early runners was the new way when within 2 years you could be running for $3.5 million via the Golden Slipper Stakes. Analyst Blaazing Ben Perkins is one of Australia’s most informed and best judges of Racing form over a long period of time with his insightful and colourful commentary and he will be there with all of the form and tips for a big Sydney Autumn Racing Carnival 2018.
iTipsports Racing provides Sydney Racing Expert tips for the Golden Slipper Stakes. There are a number of Slipper lead up races for two-year-olds at Rosehill like the Riesling Slipper Trial, Todman Slipper Trial and the Pago Pago Stakes. These races provide Golden Slipper ballot exemptions for winners. This race is generally won by a horse on the up and being a last start winner is not necessarily the pre requisite however running well in the Todman or the Reisling Slipper has been a good recipe with 6 of the last 10 coming through these races. It’s a high pressure race that only the strong survive, that is horse, jockey and trainer alike. More often than not is is won by a run on horse as the tactical battle and adrenaline running through horse and jockey normally set a cracking pace and the horse that nestles away gets a soft run and finishes powerfully can win. It is worth noting barrier 1 is the highest winning barrier and this is a good indication that an efficient run is a big plus. Other major Group races on Golden Slipper Stakes Day as part of the Sydney Racing tips Autumn Carnival at Rosehill racecourse are the George Ryder Stakes, The Ranvet Stakes and The Galaxy.